I have experienced a multitude of work environments over the years, from wide open office buildings to cubicles to creating an office (or four) in our home. I have definitely learned over the years how important it is to love the space you spend so much time in. 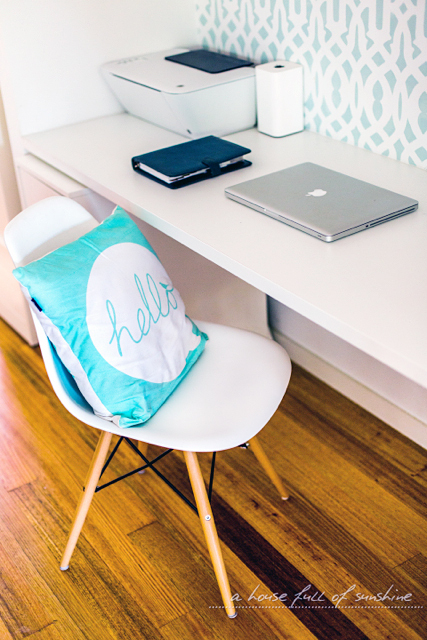 It can impact you on so many levels (think personal, business, financial, emotional....), and there are a variety of ways you can personalize your workspace to be a place you enjoy, no matter what the location. Karen is always a source of inspiration for me; as a friend first, but also as a fellow mother, organizer and lover of all things home. I adore her style and that she isn't afraid to play with color and pattern, while continuously thinking of ways to create a marriage of form and function. Today she is inspiring me to get to work on the space I call home many hours of the week; my office! 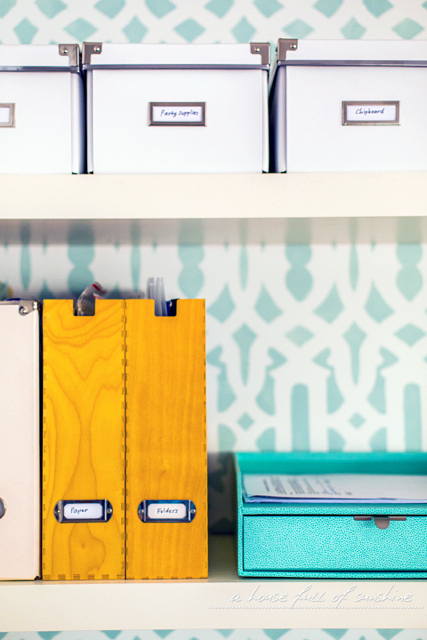 I appreciate all of her tips for making a workspace feel personal and effective with just a few small touches. Best of all, many of her tips can be applied whether you commute to the office or walk down the hall. Hi, friends! One of the first things I love to do when we move house is set up an inspiring work area. 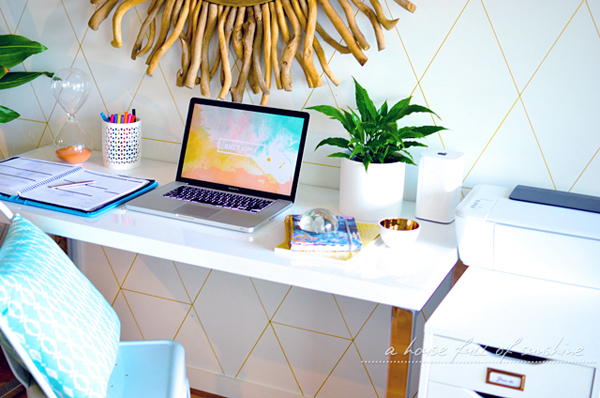 I've come to realize that I work best when my home office space is neat, orderly and functional... yet also pretty. When I take the time to think about how a space looks and how it makes me feel, I find that I'm so much more motivated to spend time there. 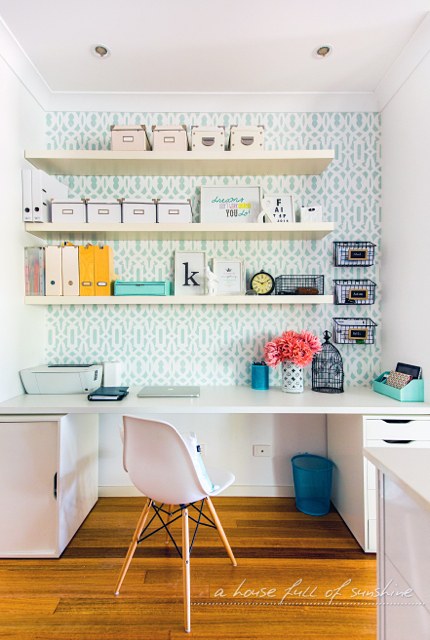 So today I thought I'd share some tips for creating an organized home office area that you'll love to hang out in! 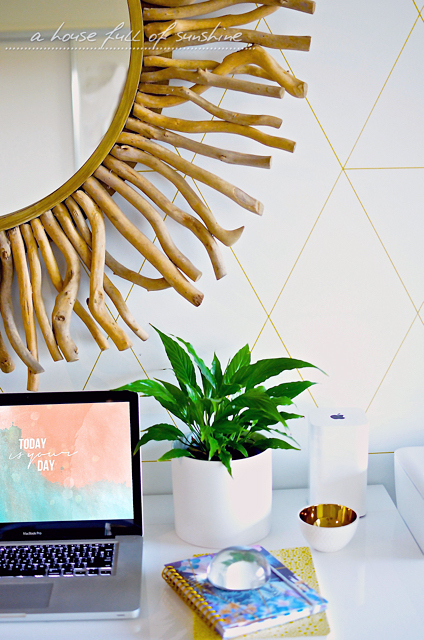 Let's face it - when it comes to your home office area, you're going to spend an awful lot of time staring directly at the wall in front of you. Unless you're lucky enough to have a work area with a view, or a generous enough floor area to position your desk in the middle of the room looking out, most of us will at some point be stuck facing a blank wall. The good news is that it doesn't have to stay blank. In the example above, I used a trellis-patterned stencil to create a pretty feature wall in soft mint. 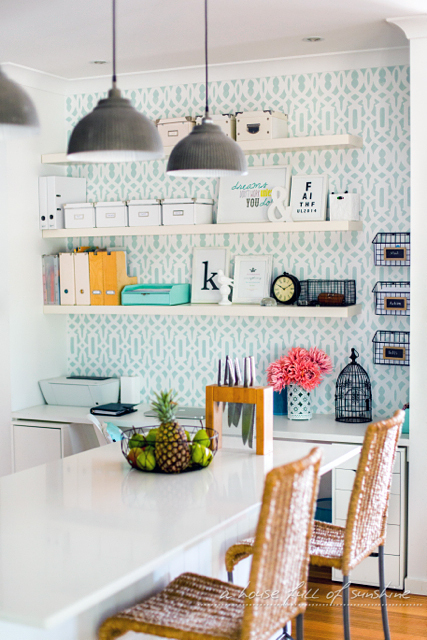 You can see the easy tutorial (and some more pics of this home office space) right here. 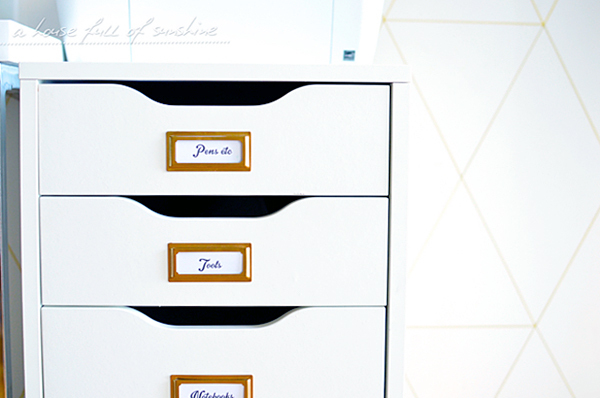 You can find out how to create your own sharpie faux wallpaper here. More pics of this home office space can be found in this post. Storage is always an issue, especially when your home office area is open-plan, like both of mine. 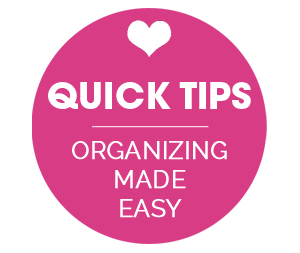 You want to keep your work area looking neat and clutter-free, but it can be hard when there's SO much to store! I'd suggest starting with a ruthless cull of everything you don't actually need or use. It's amazing how much junk we hold onto that serves no purpose and merely adds to our sense of stress and overwhelm. 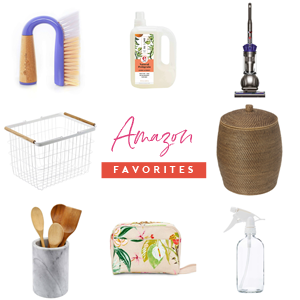 I wrote a checklist of 250+ things you can get rid of from your home that you'll never even miss. 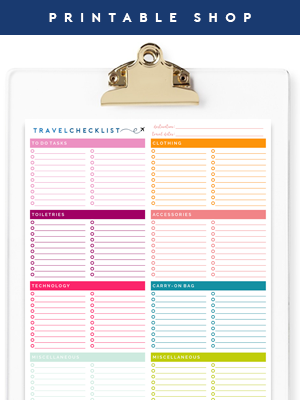 It's organized by zone, so there's a checklist specific to the home office area. Now that you've purged your excess and have only kept items you use and love, create smart storage by thinking vertical. Even in an area with very little floor space, you can add floating shelves to hold boxes and magazine files. The home office in my previous house was nothing more than a compact little nook off the kitchen. I added drawers and a cupboard under the desk, but mostly, we went up. In this way I was able to keep unnecessary clutter off my desk and create heaps more storage space, while still keeping the area looking tidy and streamlined. Mail and paperwork on my horizontal surfaces used to be the bane of my existence. 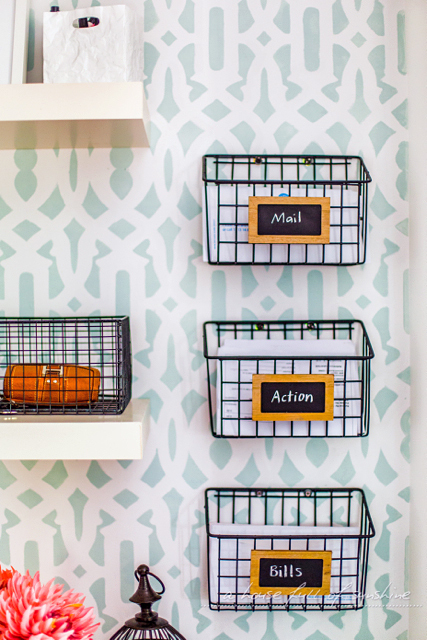 Then I DIY'd these little mail-sorting baskets (using a $5 cleaning caddy!) and my world has never been the same! As soon as mail comes into your home, categorize and conquer! I love giving myself a dash of motivation in the form of printable quotes that I display in my home office. It's like having a little cheerleader on my shoulder. I created these free motivational printables that you can use to put together a vision board of your own. Pin them to a corkboard, or stick them up with magnets, and rotate whenever you want a fresh zip of inspiration. My drawers were a complete disaster up until very recently, when I finally took the time to organize them properly. 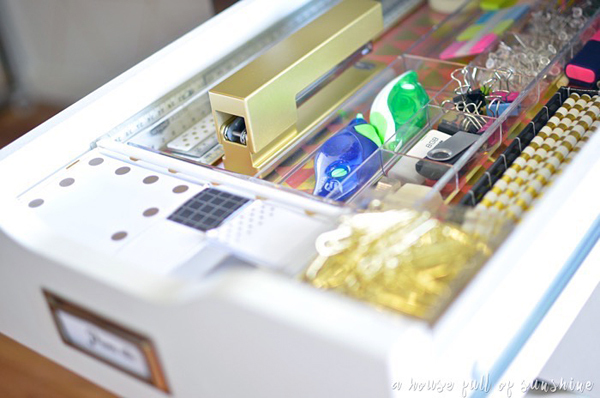 It's made a world of difference to have items sorted by category and organized with clear acrylic dividers. Now instead of digging through piles of clutter, I just reach in and grab what I need. You can see my before and after pics and the process I used here. 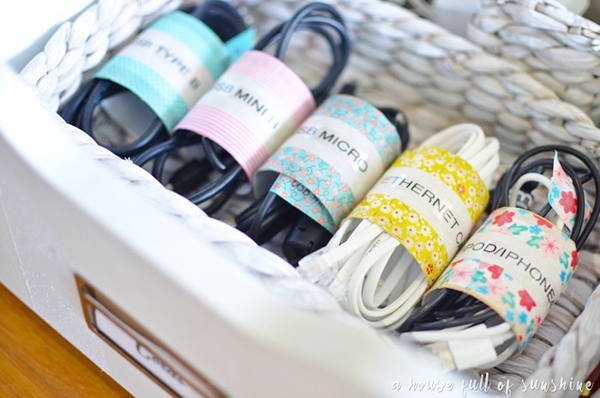 I also took the time to sort and label the cords for our electronics, using toilet rolls and washi tape. SO much better! This one is a must, but something so easily forgotten! If you plan to spend much time with your backside planted in that office chair, make sure it's a comfortable one. Padded office chairs are great, although a simple moulded seat paired with a decorative pillow is another cozy and visually appealing solution. I didn't bother about doing this for the longest time, but once I did, I wished I'd done it sooner! It literally takes minutes to download a pretty new design for your desktop, making it the quickest and easiest way to refresh your workspace. I created a set of free watercolour desktop designs that you can download here for personal use. Last but not least, if you can't be outside in the fresh air because you have to work, bring some of the outdoors in! 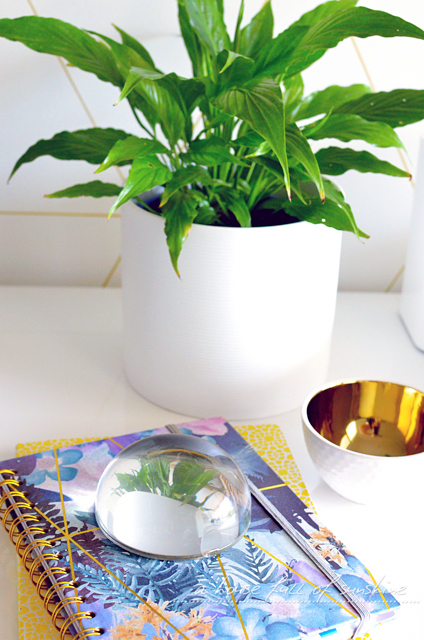 Adding a potted plant is a wonderful way to rejuvenate your work space. The shot of green will make you feel happy and connected to nature, and even better, the plant will filter and purify the air around you from indoor pollutants, giving a breath of life in more ways than one. 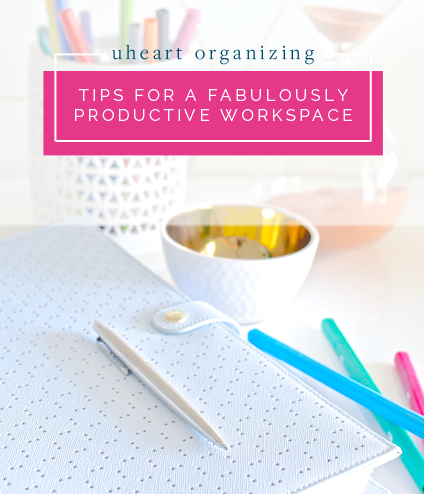 I hope you enjoyed these tips for creating a clutter-free, organized, pretty and inspiring work space! Thanks for having me here today Jen and iHeart readers, it's always such a treat to share with you. Hi friends, I’m Karen from A House Full of Sunshine. Do you see that grin I can’t wipe off my face? That’s how thrilled I am to be here! 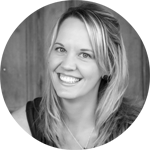 I live in Australia where I’m blessed to be a stay-home mummy to my four little people. I’m also a part-time interior decorator and a former teacher of Creative Arts. 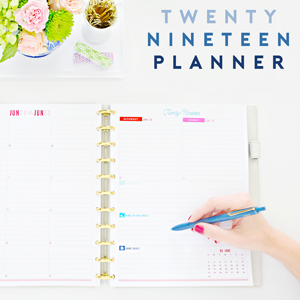 Basically, I’m happiest when I’m squeezing every drop of creativity out of life – whether that means decorating a room, inventing a fun new activity to do with the kids, thinking up pretty organizing solutions or putting together a DIY project. I believe life is meant to be beautiful, and home is an expression of the heart. My blog, A House Full of Sunshine, is the place where I share my adventures in creative home-making with kids. The coffee’s on and the welcome mat is out – I’d love to see you there! LOL! Love it, Megan. :) Good luck with sneaking some of these ideas into the man cave. And enjoy your new craft room!! Thanks Sarah, glad they're helpful for you! Awesome tips! And perfect timing, too, seeing as I am currently unpacking boxes on boxes in my new house! Oh, new house - how fun! Unpacking, not so much. If only we could have one without the other. :) All the best getting settled into your new place. I hope it feels like home very soon! Love your tips and the space is beautiful! I love the open shelving and colors you brought together! 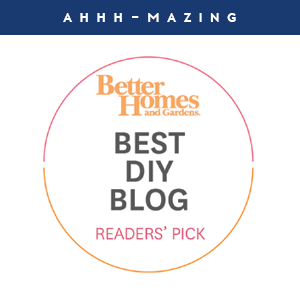 I totally heart the overall idea: keep your home simple and beautiful. This is what I really love from this awesome blog! The funny thing about this post is that my current office space has all the same basics (similar looking white desk, the floating white shelves). I love the additions that make this space just that much more amped up. Awesome, Souda! Once you have the basics in place it really doesn't take much to bring it up to the next level. Just a little pinch of creativity. So many possibilities! You're so kind, Caley-Jade! Thanks love! I still love the blue wallpaper wall soooo much. The floating shelves are just beautiful. Amazing ideas! You have made the space look so clean and bright. You've convinced me! My current office is in the kitchen and while handy, I'm staring at the control pad for our alarm system. I have a lovely white desk in a brightly lit spare room that I'm going to fancy up using your fabulous tips. I'm so excited! Thank you so much for your amazing tips! 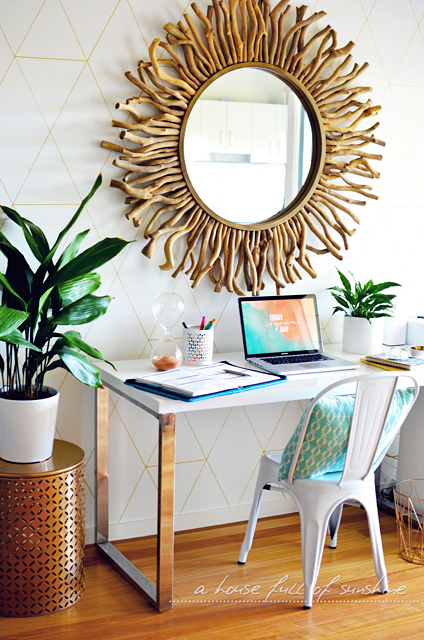 I am decorating my home office at the moment and having so much fun with it! 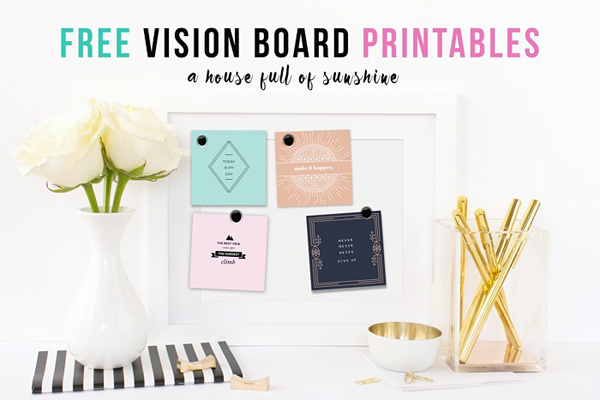 Can't wait to hang the Vision Board printable! I like the idea of bringing greenery into the space. Interesting planner(?) cover. Where is that from? ?